It's blog tour time. You guys, I'm so excited for today's post. This is the first time I've ever had a guest post and who better to be the star writer than Deborah Hopkinson! 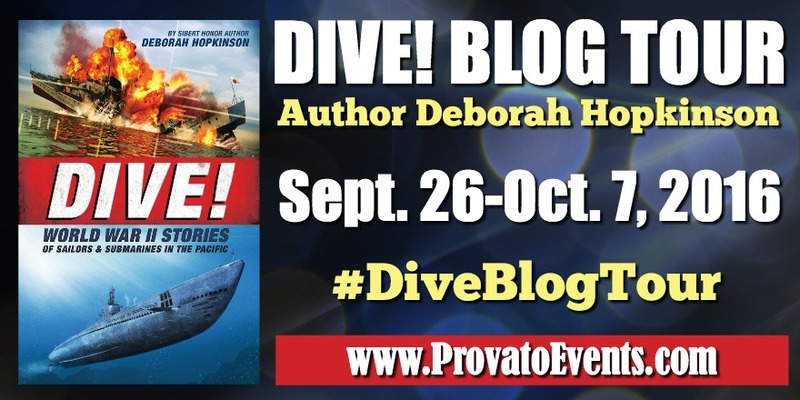 Deborah Hopkinson’s new book, Dive! WWII Stories of Sailors and Submarines in the Pacific, is her fifth work of nonfiction for Scholastic. 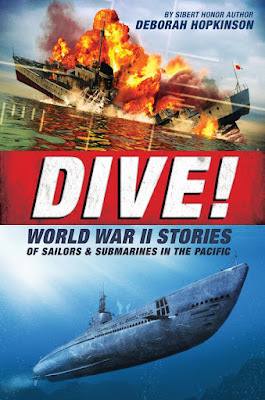 Dive!, which has received three starred reviews, is the second of three planned books on World War II. The first, Courage & Defiance: Stories of Spies, Saboteurs, and Survivors in WWII Denmark, was named an Orbis Pictus Recommended book and received the Oregon Spirit Award for nonfiction. 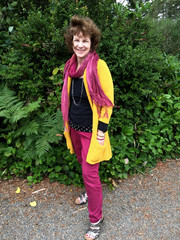 Deborah, who will be teaching a nonfiction workshop for Highlights Foundation with nonfiction author Pamela Turner in October offers five tips for novice and aspiring nonfiction writers. 1 - Read nonfiction—Lots of it! This may seem obvious advice, but it’s essential. Today there are more nonfiction books being published than ever before. Works range from science, history, sports, and biography. To find new titles, look online, visit a bookstore, or spend time in your local library. Many public libraries, especially those which serve homeschooling populations, boast strong nonfiction collections. Whether you’re interested in writing for preschoolers or young adults, seeing other new books will help familiarize you with the market. When I present to students in schools, someone almost always asks where I get my ideas. I tell young readers that I always keep my story antennae up, just like a little snail. Ideas for nonfiction magazine articles or books can come from almost anywhere: NPR news, a television documentary, your local newspaper, a walk through your city or town, a road trip, or even a casual conversation with a stranger. History is my passion. Middle school students sometimes ask if I plan to write a fantasy, but I can’t imagine running out of fascinating historical subjects to explore. Most often, I tackle a project as an amateur historian on the hunt to understand a topic. Some of my own interests have cropped up in my books, both nonfiction and fiction. I grew up in Lowell, Massachusetts, and wrote about the industrial revolution; an interest in Dickens led to a historical fiction picture book, and Dive! came about, in part, because I recall reading a submarine adventure when I was a girl. It helps if writers possess authentic knowledge or personal experience. So whether it’s beekeeping, knitting, dog breeds, or local history, start writing about what you love. When evaluating sources or ideas, make sure that you can craft a compelling, page-turning story with the same elements that make fiction so appealing to readers of any age. Sometimes, an incident or event will seem fascinating, but the available information is too thin, or there’s not a wide enough appeal. Before undertaking a new nonfiction project, I always assess whether I have adequate resources, fascinating characters, and a dramatic storyline. Go to www.scbwi.org. I give this advice to anyone interested in writing for children. The Society of Children’s Book Writers and Illustrators is the national professional organization supporting creators of children’s literature. From two national annual conferences, to local critique groups and state conferences, SCBWI offers a wealth of resources. Visit Deborah at www.deborahhopkinson.com or follower her on Twitter @deborahopkinson. Thanks again to Deborah Hopkinson for appearing! 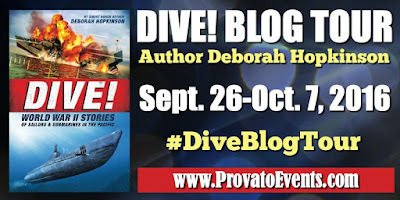 For other stops on the Dive Blog Tour please check deborahhopkinson.com. And be sure to use this hashtag: #DiveBlogTour.